STEUBENVILLE, Ohio (CNS) — Franciscan Father Sean O. Sheridan, president of Franciscan University of Steubenville since 2013, said that “after a great deal of prayer,” he submitted his resignation to the university’s board of trustees. “I feel called to continue my service to the Catholic Church in another capacity,” he said in a statement released by the university April 8. He said his new assignment would be “determined in consultation” with the minister provincial of his religious order, the Franciscan Friars of the Third Order Regular. 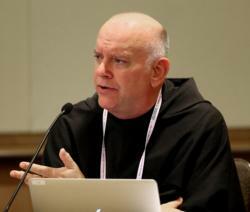 “I will miss my brother friars, the extended Franciscan University family and the great community surrounding it, but this is an appropriate time for the board to initiate a search for a new president who will be available to welcome the incoming class this fall,” Father Sheridan said. He submitted his resignation to the board of trustees April 5. The board accepted it and announced it will begin the search for its seventh president immediately. Father Sheridan said he would remain at Franciscan University until the end of the current academic year. University officials said they expect a new president will be in place by the beginning of the fall semester. “We are thankful for Father Sheridan’s years of leadership and dedication throughout which he continued the Franciscan University tradition of exceptional education grounded in a passionately Catholic faith that enables our alumni to evangelize and transform the culture,” said Franciscan Father Malachi Van Tassell, chairman of the board of trustees. Highlights of Father Sheridan’s six-year tenure include welcoming the largest incoming class in the school’s history last fall. He also launched the Catechetical Institute, which reaches over 100 dioceses in the United States, as well as dioceses in Africa and Eastern Europe. The institute offers courses, conferences, advice and resources for clergy, parents “and all those responsible for the work of catechesis and evangelization,” according to its website. He also hosted three symposia celebrating the 25th anniversary of “Ex Corde Ecclesiae” (“From the Heart of the Church”), an apostolic constitution issued in 1990 by St. John Paul II that outlines the identity and mission of Catholic colleges and universities and provides universal norms to ensure colleges maintain these standards.